Our wide range of machining capabilities and quality practices allow us to provide much more than just gages. Many of the custom products we manufacture are used as machine components, medical products, hand tools, automotive parts, and aerospace products. Let us help you realize increased production rates by reducing wastes such as waiting, defects, and excessive motion. Rather than fumble trying to make do with “off the shelf” items, your employees will be more productive using a tool made specifically for your application. Help your employees improve their production by contacting us with your specifications. Whether you need a small quantity or plan to distribute internationally for private label, we can provide pricing and lead times to meet your demands. Our on-site technicians and fully-equipped production facilities can provide you with ideas and methods that work. Contact Eastern Industries today for a custom quote. This is what we do best! We can provide special markings, blade shapes, blade sizes, assembly options, and alternative packaging options to meet your specific needs. Custom gages can quickly be made from any of our stock materials, including high carbon steel and stainless steel. Special materials are also available. Our on-site, full service machining capabilities allow us to offer many value-priced options designed to accommodate almost any application. A properly designed tool can improve production efficiency and productivity. Common applications are lead protrusion gages, machine components, and special profile gages. Form ground or EDM wire cut blades, shapes are available as single size lots, or they can be applied to entire gage sets. We can also provide special markings, blade sizes, assembly options, and packaging to meet your requirements. We manufacture custom doctor blades up to 24″ long with ground and lapped edges straight within .001. Whether using standard material from our extensive inventory, or special material that you specify, our short lead times will measure up to your expectations. Extra length gages can quickly be made using our extensive selection of on-site stock materials. Gages are available as single blades or as a set. We commonly manufacture air gap gages for power and utility companies in 24″, 36″, and 48″ lengths. Blade thickness from .0005″ to .040″ can be made to any length. 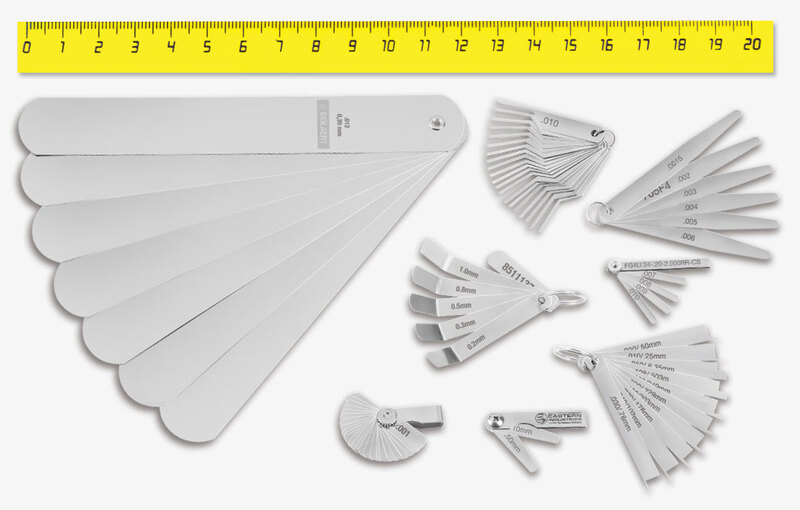 In that size range we have provided gage sets from 1 inch long to over 4 feet long with U shaped fan style holders. All material is permanently marked with the thickness for easy identification. Metric sizes are also available. The special gages in this thicker size range are made from our stock raw material, which is the finest quality high carbon steel. Our materials are always fully hardened to provide stable accuracy and superior wear resistance. Because we finish grind each blade to size, we are able to offer “in between” sizes in any .0001″ increment on thicknesses and widths. These custom gages are available with a quick turnaround time in lengths up to 24″. The standard tolerance is ±.0005″ (±.0127mm). However, thickness tolerances of ±.0001 are available if your application requires it. When a step is added, you get two gages in one. Use as a Go/No-Go gage or use each end for different applications. Steps can be a huge time saver for your employees and they reduce the number of overall tools required. All gages are permanently marked with the thickness for easy identification. Our stamping and bending facilities will enable you to design a way around obstructions. Special cut off, grinding, and laser capabilities allow us to manufacture the right tool to do the job right. If we can’t get around it by bending, we can manufacture assemblies that are precise and durable. In many cases, the measuring blade is made from our standard close tolerance feeler gage stock, securely silver-soldered to a custom handle. Special blades are also available. We can also provide gages with special markings, blade shapes, blade sizes, assembly options, and packaging to meet your needs. We have the ability to laser mark or laser engrave your part numbers, logos, bar codes, serial numbers or graduated scales. Spot weld multiple or extra thin gages together to allow accurate and flexible measurements. Riveted assemblies guarantee feeler gages won’t come undone while measuring your products. Private label packaging and fast lead times allow you to keep inventories low and keep promises to your customers. Your requests will be promptly quoted and our efficient on-site operations will assure you of quick production turnarounds and deliveries.